I was born in Marseille, France, on November 11, 1959. I graduated from the École Normale Supérieure de Cachan and received the Agrégation of Physics in 1981. I joined the Laboratoire d'Optique Électromagnétique in 1985 (which is now in the Institut Fresnel), and I am currently Professor in the University of Aix-Marseille. My PhD (1990) dealt with diffraction by gratings, development of new methods, and application to anisotropic structures. I have been later mainly interested in the investigation of photonic crystals and metamaterials properties. Please note that the published papers available below in electronic versions are copyrighted by their respective journal. For more details, see: OSA, IEEE, Taylor and Francis, or the various other copyright holders websites. Some of these papers cannot be offered publicly. In that case you will be asked for a login and a password. Drop me an email to get them. D. Maystre, G. Tayeb, D. Felbacq. Electromagnetic study of photonic band structures and Anderson localization, in Microcavities and Photonic Bandgaps: Physics and Applications, Edited by J. Rarity and C. Weisbuch, Kluwer Academic Publishers, NATO Advanced Study Institute Series E, Vol.324, Dordrecht, 1996 (ISBN: 0792341708). D. Maystre, M. Saillard, G. Tayeb. Special methods of wave diffraction. Chapter 1.5.6 in Scattering, Editors P. Sabatier and E.R. Pike, Academic Press, London, 2001 (ISBN: 0126137609). PDF version. D. Maystre, G. Tayeb, P. Vincent, S. Enoch, G. Guida. Electromagnetic modelling of dielectric and metallic photonic crystals. Mechanical and Electromagnetic Waves in Structured Media, Editors: R.C. McPhedran, L.C. Botten, N.A. Nicorovici, Solid Mechanics and Its Applications SMIA Vol. 91, Chapter 19, p.241-256, Kluwer Academic Publishers, 2002 (ISBN: 0792370384). PDF version. D. Maystre, S. Enoch, G. Tayeb, "Scattering Matrix Method applied to photonic crystals", Chapter 1, p.1-45 of Electromagnetic Theory and Applications for Photonic Crystals , Ed. Kiyotoshi Yasumoto, CRC Press, Taylor & Francis, 2006 (ISBN: 0849336775). Flyer. B. Gralak, S. Enoch, G. Tayeb, "Superprism Effects and EBG Antenna Applications", Chapter 10, p.261-283 of Metamaterials: Physics and Engineering Explorations, Ed. Nader Engheta and Richard W. Ziolkowski, John Wiley & Sons Ltd.,2006 (ISBN: 0471761028). G. Tayeb. Dispersion in photonic media and diffraction from gratings: a different modal expansion for the R-matrix propagation technique: comment. J. Opt. Soc. Am. A, Vol. 13, No.8, p.1766-1767, 1996. PDF. B. Gralak, S. Enoch and G. Tayeb. Anomalous refractive properties of photonic crystals. J. Opt. Soc. Am. A 17, p.1012-1020, 2000. PDF version. S. Enoch, G. Tayeb, and D. Maystre. Dispersion diagrams of Bloch modes applied to the design of directive sources. Invited paper in the special issue on "Electromagnetic Applications of PBG materials and Structures", Progress In Electromagnetics Research series, vol.41. Editors: T. Itoh and A. Priou, p.61-81, 2003. online PDF, local PDF. G. Tayeb, S. Enoch, Combined Fictitious Sources - Scattering Matrix method, J. Opt. Soc. Am. A 21, No.8, p.1417-1423, 2004. PDF. Here is a page where you can test the code by yourself. G. Benelli, S. Enoch and G. Tayeb, "Modelling of a single object embedded in a layered medium", Journal of Modern Optics, Vol. 54, No. 6, 871–879 (2007). Note for the PDF. S.A. Ramakrishna, S. Guenneau, S. Enoch, G. Tayeb, B. Gralak, "Confining light with negative refraction in checkerboard metamaterials and photonic crystals", Phys. Rev. A 75, 063830 (2007). PDF. S. Guenneau, S. Anantha Ramakrishna, S. Enoch, S. Chakrabarti, G. Tayeb and B. Gralak, "Cloaking and imaging effects in plasmonic checkerboards of negative epsilon and mu and dielectric photonic crystal checkerboards", Photonics and Nanostructures - Fundamentals and Applications, Special issue in Nanophotonics (editors Ozbay and Soukoulis), 63-72 (2007). Abstract. PDF. I. Gallina, A. Della Villa, V. Galdi, V. Pierro, F. Capolino, S. Enoch, G. Tayeb, G. Gerini, "Aperiodic-Tiling-Based Mushroom-Type High-Impedance Surfaces", IEEE Antennas and Wireless Propagation Letters, 7, p.54-57 (2008). PDF. M. Farhat, S. Guenneau, S. Enoch, G. Tayeb, A.B. Movchan, N.V. Movchan, "Analytical and numerical analysis of lensing effect for linear surface water waves through a square array of nearly touching rigid square cylinders", Phys. Rev. E 77, 046308 (2008). PDF. Jin-Long Zhang, Hai-tao Jiang, Stefan Enoch, Gérard Tayeb, Boris Gralak, and Michel Lequime, "Two-dimensional complete band gaps in one-dimensional metal-dielectric periodic structures", Appl. Phys. Lett. 92, 053104 (2008). Abstract. PDF. J. Zhang, H. Jiang, B. Gralak, S. Enoch, G. Tayeb and M. Lequime, "Compensation of loss to approach –1 effective index by gain in metal-dielectric stacks", Eur. Phys. J. Appl. Phys., Published online: 25 July 2008. DOI: 10.1051/epjap:2008148. Abstract. PDF. B. Gralak, R. Pierre, G. Tayeb, and S. Enoch, Solutions of Maxwell's equations in presence of lamellar gratings including infinitely conducting metal, J. Opt. Soc. Am. A 25, No.12, p.3099-3110 (2008). PDF. N.-A. Nicorovici, R. McPhedran, S. Enoch, G. Tayeb, "Finite wavelength cloaking by plasmonic resonance", New Journal of Physics 10 (2008) 115020. (Special issue: Focus on Cloaking and Transformation Optics, Ed. Ulf Leonhardt and David R Smith). PDF. N. Bonod, G. Tayeb, D. Maystre, S. Enoch, E. Popov, "Total absorption of light by lamellar metallic gratings", Opt. Express 16, 15431-15438 (2008). PDF. R. Pierre, G. Tayeb, B. Gralak, S. Enoch, "Quasi-TEM modes in rectangular waveguides: a study based on the properties of PMC and hard surfaces", J. Modern Optics, 56, 4, 530–538 (2009). PDF. DOI: 10.1080/09500340802604146. Published version and copyright issues. A. Micco, V. Galdi, F. Capolino, A. Della Villa, V. Pierro, S. Enoch, G. Tayeb, "Directive emission from defect-free dodecagonal photonic quasicrystals: a leaky wave characterization", Phys. Rev. B 79, 075110 (2009). PDF. W. Smigaj, B. Gralak, R. Pierre, G. Tayeb, "Antireflection gratings for a photonic-crystal flat lens", Optics Letters, Vol. 34, Issue 22, pp. 3532-3534 (2009). PDF. E. Popov, D. Maystre, G. Tayeb, "Whispering gallery modes and other cavity modes for perfect backscattering and blazing", J. Opt. Soc. Am. A 27, No.7, p.1584-1592 (2010). PDF. R. Abdeddaim, A. Ourir, J.-M. Geffrin, J. De Rosny, G. Tayeb, "Les métamatériaux: une solution pour l'ingénierie d'indice complexe", Revue de l'Electricite et de l'Electronique, 4, p.59-62 (2013). PDF. M. Lecureux, S. Enoch, C. Deumie, G. Tayeb, "Electromagnetic sunscreen model: implementation and comparison between several methods: step-film model, differential method, Mie scattering, and scattering by a set of parallel cylinders", Applied Optics Vol.53, Issue 28, pp.6537-6545 (2014). Abstract. PDF. Y. Brule, G. Demesy, A.-L. Fehrembach, B. Gralak, E. Popov, G. Tayeb, M. Grangier, D. Barat, H. Bertin, P. Gogol, B. Dagens, "Design of metallic nanoparticle gratings for filtering properties in the visible spectrum", Applied Optics Vol.54, Issue 35, pp.10359-10368 (2015). Abstract. PDF. L. Ceresoli, R. Abdeddaim, T. Antonakakis, B. Maling, M. Chmiaa, P. Sabouroux, G. Tayeb, S. Enoch, R. Craster, S. Guenneau, "Dynamic effective anisotropy: Asymptotics, simulations, and microwave experiments with dielectric fibers", Phys. Rev. B 92, 174307 (2015). DOI. PDF. Dispositif de vision tête haute avec lame à surface réfléchissante. Brevet 1550086 (2015). Anne-Laure Fehrembach, Béatrice Dagens, David Bara, Boris Gralak, Evgueni Popov, Guillaume Demésy, Gérard Tayeb, Hervé Bertin, Philippe Gogol, R. Megy, Yoann Brûlé, Yam Navy, Li Qiran, Matthias Grangier. M Alaoui, K Rustomji, TM Chang, G Tayeb, P Sabouroux, R Quidant, S Enoch, S Guenneau, R Abdeddaim, "Cyclic concentrator, carpet cloaks and fisheye lens via transformation plasmonics", Journal of Optics, Vol.18, No.4, p.044023 (2016). Elodie Georget, Michel Luong, Alexandre Vignaud, Eric Giacomini, Edouard Chazel, Guillaume Ferrand, Alexis Amadon, Franck Mauconduit, Stefan Enoch, Gérard Tayeb, Nicolas Bonod, Cyril Poupon, Redha Abdeddaim, "Stacked magnetic resonators for MRI RF coils decoupling", Journal of Magnetic Resonance, Vol.275, p.11-18 (2017). K. Rustomji, R. Abdeddaim, J. Achard, M. Chmiaa, E. Georget, M. Goniche, W. Helou, J. Hillairet, S. Enoch & G. Tayeb, "Mimicking Electromagnetic Wave Coupling in Tokamak Plasma with Fishnet Metamaterials", Scientific Reports, Vol.8, 5841 (2018). DOI. PDF. Supplementary materials. Light Given New Direction. Physical Review Focus, 12 Nov. 2002. Metamaterial bends microwaves into beam or this local copy. Nature Science Update, 23 Nov. 2002. Matériau composite pour antenne plane. La Recherche 360, p.10, janvier 2003. Une antenne parabolique directionnelle... plane. Industrie et Technologies, No 845, p.22, février 2003. 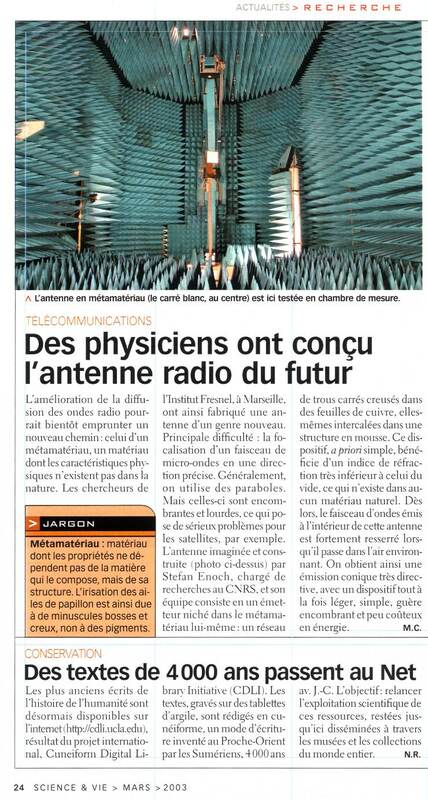 Des physiciens ont conçu l'antenne radio du futur. Science & Vie, p.24, mars 2003. R. Petit, G. Tayeb. About the electromagnetic theory of gratings made with anisotropic materials. In "Application and Theory of Periodic Structures, Diffraction Gratings, and Moire Phenomena III", Vol.815, Chap.2, p.11-16, Ed. J.M. Lerner, SPIE, 1987. (San Diego, ISBN 0892528508). PDF. R. Petit, G. Tayeb. On the use of the energy balance criterion as a check of validity of computations in grating theory. In "Application and Theory of Periodic Structures, Diffraction Gratings, and Moire Phenomena III", Vol.815, Chap.1, p.2-10, Ed. J.M. Lerner, SPIE, 1987. (San Diego, ISBN 0892528508). PDF. G. Tayeb, R. Petit, M. Cadilhac. On the theoretical and numerical study of diffraction gratings coated with anisotropic layers. In "Optics and the information age", Vol.813, p.407-408, Ed. H. Arsenault, SPIE, 1987. (Quebec). G. Tayeb. Sur la résolution de l'équation rot rot E - [A] E = S en théorie des réseaux anisotropes. Proceedings of the 9th Colloque "Hertzian Optics and Dielectrics", Pise, p.201-204, 1987. PDF. G. Tayeb, R. Petit. Sur la valeur du critère de conservation de l'énergie en tant que test de validité des calculs numériques sur ordinateur. Proceedings of the 9th Colloque "Hertzian Optics and Dielectrics", Pise, p.198-200, 1987. PDF. G. Tayeb, R. Petit. Researches on gratings made with anisotropic materials: how is the work progressing in our Laboratory. In "Scattering and Diffraction", Vol.1029, Chap.26, p.170-177, Ed. H.A. Ferwerda, SPIE, 1988. (Hamburg, ISBN 0819400645). PDF. G. Tayeb, R. Petit. Periodic structures and anisotropic media: a comparison of the numerical results obtained by integral and differential methods. In "Scattering and Diffraction", Vol.1029, Chap.25, p.168-169, Ed. H.A. Ferwerda, SPIE, 1988. (Hamburg, ISBN 0819400645). PDF. R. Petit, G. Tayeb. Sur le réseau formé de lames infiniment minces infiniment conductrices séparées par un diélectrique (symmetrical strip-grating-loaded-slab). Comptes Rendus du 10ème Colloque "Optique Hertzienne et Diélectriques", Rennes, p.287-290, 1989. R. Petit, G. Tayeb. Sur l'étude numérique d'un réseau conducteur inséré dans un empilement de lames minces. Comptes Rendus du 10ème Colloque "Optique Hertzienne et Diélectriques", Rennes, p.291-294, 1989. R. Petit, M. Cadilhac, G. Tayeb. On the electromagnetic theory of anisotropic gratings. Proceedings of the 1989 URSI Symposium on Electromagnetic Theory, Stockholm, p.283-285, 1989. PDF. G. Tayeb, R. Petit, M. Cadilhac. Synthesis method applied to the problem of diffraction by gratings; the method of fictitious sources. In "Application and Theory of Periodic Structures", Vol.1545, Chap.10, p.95-105, Ed. J.M. Lerner and W.R. McKinney, SPIE, 1991. (San Diego, ISBN 0819406732). Link. R. Petit, G. Bouchitté, G. Tayeb, F. Zolla. Diffraction by one-dimensional or two-dimensional periodic arrays of conducting plates. In "Application and Theory of Periodic Structures", Vol.1545, Chap.4, p.31-41, Ed. J.M. Lerner and W.R. McKinney, SPIE, 1991. (San Diego, ISBN 0819406732). Link. D. Felbacq, G. Tayeb, D. Maystre. Diffraction par des cylindres parallèles de sections arbitraires. Comptes Rendus du 12ème Colloque "Optique Hertzienne et Diélectriques", Paris, p.1BP 9-12, 1993. D. Maystre, D. Felbacq, and G. Tayeb. Localization of electromagnetic fields by randomly rough surfaces and large period gratings. In Mathematics and Control in Smart Structures, Ed. H.T. Banks, Vol.2192, Chap.42, p.358-369, SPIE 1994. (Orlando USA, February 1994, ISBN 0819414875). Link. D. Maystre, G. Tayeb, D. Felbacq. Theoretical study of photonic band gap structures. In Optics for Science and New Technology, Ed. J. Chang, J. Lee, S. Lee and C. Nam, Vol.2778, p.740-743, SPIE 1996. D. Felbacq, G. Tayeb. Étude numérique des propriétés homogènes de structures bidimensionnelles périodiques. Actes du Colloque OHD'97, Clermont-Ferrand, ISSN 0249-7042, Vol. 103, 34ème Fascicule, p.241-243, 1997. S. Enoch, N. Guérin, G. Tayeb, P. Vincent, Study of photonic crystal based directive antennas, Proceedings of the 24th. ESTEC Antenna Workshop on innovative periodic antennas, Noordwijk (Netherlands), ESA-WPP-185, p.11-16, 2001. Paper, PDF. Slides. N. Guérin, S. Enoch, G. Tayeb, P. Vincent, Fonction de Green des réseaux bipériodiques. Application à l'étude d'antennes directives utilisant des cristaux photoniques métalliques. Actes du 16ème Colloque "Optique Hertzienne et Diélectriques", Le Mans, Sept. 2001. PDF version. E. Popov, M. Nevière, B. Gralak, G. Tayeb, The classical differential method, the rigorous coupled wave theory, and the modal method: comparative analysis of convergence properties in staircase approximation. Physics, Theory, and Applications of Periodic Structures in Optics, Ph. Lalanne, Editor, Proc. of SPIE, Vol.4438, p.12-18, 2001. Abstract. Link. B. Gralak, S. Enoch, G. Tayeb. Radiating dipoles in woodpile and simple cubic structures. 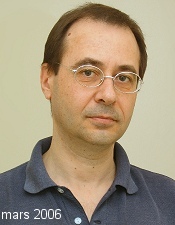 In Photonic Bandgap Materials and Devices, Editors A. Adibi, A. Scherer, S.Y. Lin. Proceedings of SPIE (Photonics West, San Jose, USA), vol. 4655, p.241-250, Jan. 2002. ps zipped. B. Gralak, G. Tayeb, S. Enoch, E. Popov. Color rendering techniques applied to the study of butterflies wings. OSA Topical Meeting, Diffractive Optics & Micro-Optics, June 2002, Tucson, USA. G. Tayeb, S. Enoch, P. Vincent, P. Sabouroux. A compact directive antenna using ultrarefractive properties of metamaterials. ICEAA, Torino, 2003. PDF version. R. Abdeddaim, A. Ourir, J.-M. Geffrin, J. De Rosny, G. Tayeb, "Métamatériaux, une solution pour l'ingénierie d'indice complexe", Journées Scientifiques URSI, 26/27 mars 2013, PDF. S.E. Sandström, G. Tayeb, R. Petit. Conical diffraction for lossy multistep lamellar gratings: an electromagnetic explanation to optical properties in the visible domain. Proceedings of the International Symposium on Antennas & Electromagnetic Theory (ISATEM'92), Xi'an (Chine), p.C18-C21, October 1-3, 1992. D. Felbacq, G. Tayeb, D. Maystre. Diffraction par des cylindres de sections arbitraires. Congrès "Journées Nationales Micro-ondes", Brest, mai 1993. D. Maystre, G. Tayeb, D. Felbacq. Electromagnetic study of photonic band structures and Anderson localization. NATO ARW Quantum Optics in Wavelength Scale Structures, Cargese, Corsica, 26 Aug.- 2 Sept. 1995. G. Tayeb, D. Maystre. Theoretical and numerical study of the influence of defects in two-dimensional photonic crystals. Progress in Electromagnetics Research Symposium, Innsbruck, Austria, 8-12 July 1996. D. Maystre, G. Guida, G. Tayeb. Enhanced normal scattering phenomenon by lacunary gratings. Progress in Electromagnetics Research Symposium, Innsbruck, Austria, 8-12 July 1996. D. Maystre, G. Tayeb, D. Felbacq. Theoretical study of photonic band gap structures. Invited paper at the 17th Congress of the International Commission for Optics (ICO), Korea, 19-23 August 1996. O. Geoffroy, V. Novossad, M. Schlenker, Y. Souche, G. Tayeb. Diffraction magnéto-optique par des réseaux homogènes et inhomogènes. GdR Nanostructures magnétiques, Col de Porte, Grenoble, 15-16 oct. 1996. D. Maystre, D. Felbacq, G. Tayeb. Homogeneization of small composite objects. Progress in Electromagnetics Research Symposium, Hong Kong, January 6-9, 1997. G. Guida, D. Maystre, G. Tayeb, P. Vincent. Modélisation des cristaux photoniques tridimensionnels. Actes de la conférence 10èmes Journées Nationales Micro-ondes, INSA Rennes, p.218-219, 1997. G. Tayeb, D. Maystre. Modélisation des cristaux photoniques métalliques 2D et 3D. GdR Cristaux Photoniques et Microcavités, Orsay, 12 déc. 1997. G. Tayeb, G. Guida, D. Maystre, P. Vincent. Band gap properties of 2D and 3D metallic photonic crystals. Progress in Electromagnetics Research Symposium, Nantes, July 1998. G. Guida, D. Maystre, G. Tayeb, P. Vincent. Numerical study of band gaps generated by randomly perturbed metallic photonic crystals. Progress in Electromagnetics Research Symposium, Nantes, July 1998. P. Sabouroux, G. Tayeb, D. Maystre, G. Kaul. Experimental and theoretical comparison of photonic crystals transmission properties. Progress in Electromagnetics Research Symposium, Nantes, July 1998. E. Centeno, D. Felbacq, G. Tayeb. Full vector study of defect modes in two-dimensional photonic crystals. 19th EOS Topical meeting "Electromagnetic Optics", Hyères, France, September 1998. S. Enoch, G. Tayeb, D. Maystre. Homogenization of photonic crystals. 19 th EOS Topical meeting "Electromagnetic Optics", Hyères, France, September 1998. D. Maystre, G. Tayeb, P. Vincent, S. Enoch, G. Guida. Electromagnetic modeling of dielectric and metallic photonic crystals. IUTAM Symposium on Mechanical and Electromagnetic Waves 99, Sydney, January 1999.
transparents", Conférence invitée à Horizons'99 Bordeaux 7-9 septembre 1999. S. Enoch, B. Gralak, G. Tayeb, and D. Maystre. Anomalous refractive properties of photonic crystals at the band edges. NATO Advanced Study Institute, Photonic Crystals And Light Localization Conference, Crete, Greece, June 19-30, 2000. B. Gralak, S. Enoch, G. Tayeb. Photonic crystals: from Bloch modes to T-matrices. Progress in Electromagnetics Research Symposium, Cambridge, July 2000. Abstract in PDF. Slides in PDF. D. Maystre, G. Tayeb, S. Enoch. Propagation of light in photonic band structures: numerical results and applications. Invited talk in the International Photonics Conference (IPC'2000), Taiwan, December 12-15, 2000. N. Guérin, S. Enoch, G. Tayeb, P. Vincent. Cristaux photoniques pour la conception d'antennes directives. Colloque OPTIX 2001, Marseille, Nov. 2001. A. Micco, V. Galdi, V. Pierro, A. Della Villa, F. Capolino, S. Enoch, G. Tayeb, "Directive emission from photonic quasicrystals with 12-fold symmetry", EMTS 2007, URSI, July 26-28, 2007, Ottawa, PDF. Contribution à l'étude de la diffraction des ondes électromagnétiques par des réseaux. Réflexions sur les méthodes existantes et sur leur extension aux milieux anisotropes. G. Tayeb. Thèse de doctorat en sciences (PhD), Université Aix-Marseille III, 5 décembre 1990. PDF. Version HAL. Mémoire d'Habilitation à Diriger des Recherches, Université Aix-Marseille III, 25 janvier 1995.